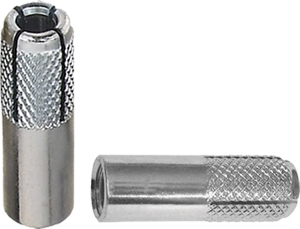 The Drop inAnchor DIA is internally threaded to offer a suitable fixing in conjunction with all standard types of metric bolts, set screws and studding. The drop in anchor DIA creates a strong, permanent and reusable female thread in the base material. After inserting the drop in anchor. • Flush surface finish means fixtures can be relocated easily material. • Versatile, Usable with standard metric bolts sets screws or studding. • No thread damage when hammering the Drop in Anchor into the drilled hole. • Stainless steel version available for corrosive environments. • No flared end for easy setting in greater depth. • Allows for shallow embedment without sacrificing performance. • Hammer set anchor with internal thread for prepositioned installation. • Suitable for all screws or studs with metric threads. • Pipes and sprinkler systems. • Non-cracked concrete = C12/15. • Natural stone with dense structure. • Anchoring light ceiling linings and suspended ceilings.